A couple months ago I wrote about my new-to-me 5D camera. Last Sunday, Lady Pebbles and I took a day trip to Cedar Breaks National Monument to make some photographs of the eclipse. It was a beautiful day. We got down there mid-afternoon to spend time scouting locations before the big event which started a couple hours before sunset. Everything was mostly dry, but there were still patches of snow in a couple places on north facing slopes on the trail. Being a nice warm day, the snow was melting, making the fine clay soil slicker than snot. As I went around one of these spots on a particularly steep slope in the trail, I stepped on what I thought was firm ground. However, it turned out to be a dry crust on top of slick mud. I immediately slid right down into the center of the snow and mud. Fortunately, I was able to catch myself and slid just on my hands and feet so I didn't get all muddy. All my gear stayed out of the mud. Except my camera. I was carrying it attached to my R-strap by my back hip. As I slid down the hill, it slid around my body and into the mud. It didn't fall; it just crept around and bumped into the ground. My hands were caked in mud and the top of the camera and lens had a little mud, but overall, things weren't too bad. I used the snow to clean my hands and the worst of the mud from the camera. Everything seemed to be in good shape. We continued scouting locations and making images. Finally we found where we wanted to stay and setup our gear. I made a couple hundred exposures of the gorgeous canyons as we waited for the eclipse to start and chatted with other photographers setting up next to us. About 45 minutes after the start of the eclipse, I clicked the shutter, looked through the viewfinder to reframe and saw nothing but black. Weird. I hit the shutter release. It opened and stayed open for several seconds before closing again. The image was completely blown out. Really weird. I cycled power and tried again. Same thing. I took it off the tripod, removed the battery grip to really make sure the power was disconnected. I put it back together and tried again. Still the same thing. Hmm. I took the lens off and immediately saw the problem. Arg. The partially silvered mirror that allows you to see through the lens had separated from the flippy-uppy thing that takes it out of the way of the sensor. Hence the black viewfinder. And since the exposure meter is mounted behind it, it wasn't geting the proper readings, causing the long exposure times. 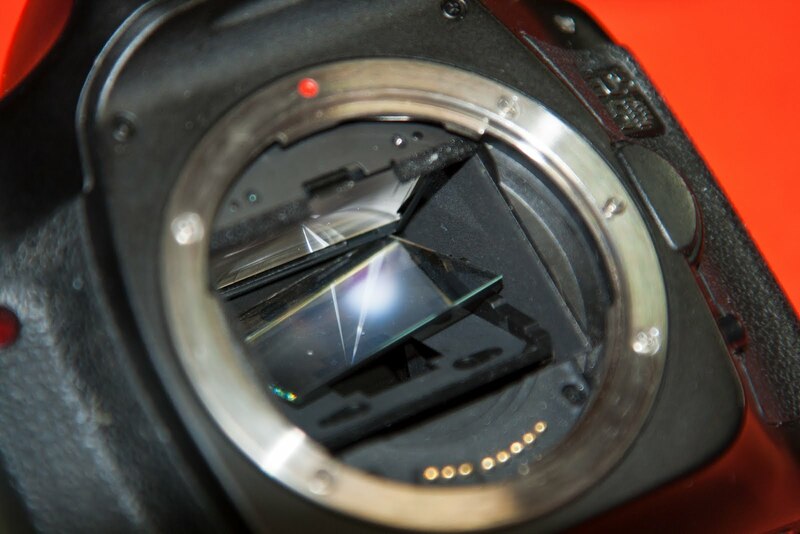 This is actually a known problem with the 5D model and Canon has a recall notice out on it. I'm not sure if this body has been in for the recall upgrade or not. And I don't know if the minor tumble had anything to do with it or not. I'll be taking it in to Pictureline to have them send it in. 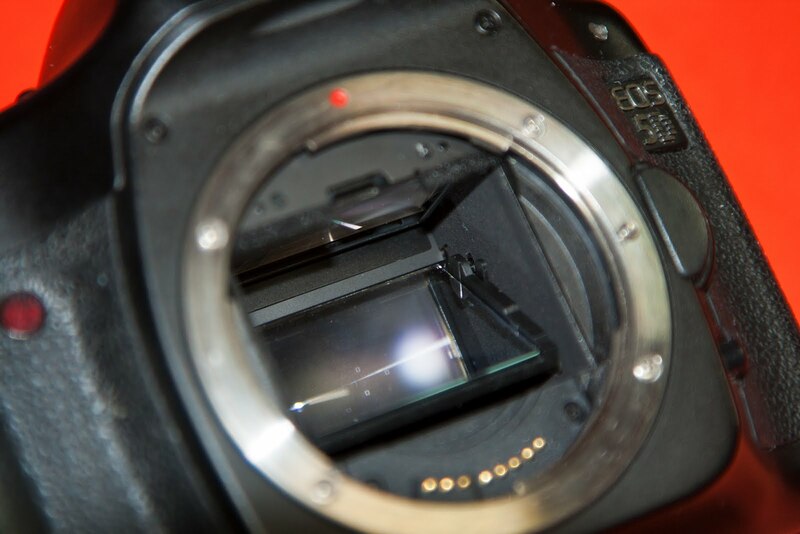 Hopefully, Canon will repair it as part of the recall, but if not, I'm going to have a camera doctor's bill shortly.